This set of Advanced Engineering Geology Questions and Answers focuses on “Causes of Mass Movements – 02”. 1. Which of the following is not a failure due to role of water? Explanation: The various causes of rock mass due to role of water are: Increase in pore pressure, accumulation of water behind the rock mass, lubrication of water etc. Water cannot get accumulated in front of the rock and if it does happen in some conditions, it does not contribute greatly to the failure. Explanation: Crystalline igneous rocks like granites and gabbros and massive metamorphic rocks like marbles, quartzites and gneisses may be stable even with vertical slopes, whereas the same cannot be said about chalk. 3. Which type of sandstone is more stable? Explanation: Sandstones for instance, occur in a great variety of types. Fine textured, dense and massive sandstones with siliceous cements may be very stable even at vertical slopes whereas the same rock with ferruginous, calcareous and clayey cements may become unstable at angle of 60° or even less. 4. What can be said about stability of slope when the layers are horizontal? Explanation: The layers horizontal layers: Such rocks forming the slopes of the natural valleys and artificial cuts are stable at all angles up to 90°. When they fail, it may be due to presence of secondary jointing or related fractures. 5. What has to be considered while giving cuts in stratified rocks? Explanation: The dip factor has to be kept in mind while giving cuts in stratified rocks. it may be possible to explain that cuts parallel to the dip of the rocks are more safe and stable compared to those parallel to the strike of layers. 6. In metamorphic rocks derived from stratified sedimentary rocks, the direction of cleavage with respect to the original bedding may cause complex system of weak planes. State true or false. Explanation: In metamorphic rocks derived from stratified sedimentary rocks, the direction of cleavage with respect to the original bedding may cause complex system of weak planes. As such slips may be of common occurrence in the slopes made of the above metamorphic rocks. 7. Which zones are most potential surfaces for rock slips? Explanation: Shear zones are most potential surfaces for rock slips, especially when lubricated with water due to soft character of the shear zone material. 8. Which of the following is an external factor for failure? Explanation: Removal of vegetation cover especially trees is an external factor that has been a contributive factor in causing slope failures in a large number of cases, including the notorious Nashri Slide near Ramban on National Highway-1 in Jammu Kashmir. 9. Majority of rocks are free from joints and cracks. State true or false. Explanation: A very few rocks are free from the structures like cracks and joints which may occur due to tension, compression or shear to which these rocks have been subjected since their formation. 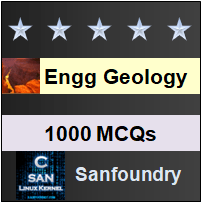 To practice Advanced questions and answers on all areas of Engineering Geology, here is complete set of 1000+ Multiple Choice Questions and Answers.